The following story has everything to do with travel products, so actually read it. Three years ago I met the most amazing guy. He was cute, funny and everything I ever wanted in a partner. There was just one problem, he was geographically undesirable. He lived in New York and I lived in Los Angeles. But I had the sense he was totally worth my time. Because his job wasn’t flexible, I had to be the one to schlep from coast to coast most of the time. It was completely annoying, but totally worth it because he eventually became my husband. So, WTF am I getting at here? Being in a long distance relationship teaches you a lot of things, including how to pack every single beauty product you need so you don’t run out or have an incident involving a bottle of eye makeup remover and a dry clean-only sweater. If you’re traveling for the holidays, especially for a period of a week or longer, you're going to need a lot of stuff. Just follow my guidelines and you will be able to take it all with you. Aren't those travel size bottles from Ulta and Sephora just darling? Nope, they're often overpriced, not-so-great for the environment, and never have quite enough product for me. The same logic applies to those TSA-friendly refillable bottle kits. In my unscientific opinion, they don’t keep products as fresh as the original packaging does. Then there is always the tiny drop at the bottom that never comes out, which is annoying and wasteful. My strategy is to bring full sized products which are already a part of my regular routine, that just happen to be packaged in a way that is conducive to travel. We all have 1000 little toiletry cases, most of which are useless. If you’ve ever had all of your products strewn about a hotel room, wondered if someone broke in, stealing your expensive moisturizer and your search became something you later referred to as an “incident”, a big toiletry case is a necessity. It allows you to keep all of your products together in one place. This cute bag from Target is perfect because it has lots of pockets and easily fits full-size bottles. If you learn just one thing from this post, it’s do not bring anything that can leak, break or is made from glass. It will be more trouble than it is worth. Tape down the caps and double Ziploc. Don’t forget to bring extra tape with you. I have separate AM and PM skincare routines, but many of my products can be used any time. So, I only take those when I travel. Here are some of my favorites. When I’m home, I use a cleansing oil to remove makeup, but the thought of travelling with a oil that can leak is enough to make me need a valium before takeoff. That’s why I always travel with Spa @Home by MasqueBAR Melting Cleanser. This K Beauty Product is a genius multi-tasker that removes both makeup and dirt. No double-cleansing necessary. Clinique Take The Day Off Eye Makeup Remover Stick is the same size as a lipstick, but has no risk of leaking, so it's ideal for traveling. A solid eye makeup remover balm, it’s perfect for on the go touchups and getting off the last bit of your mascara so you don’t become known as that guest who ruins pillowcases. Regenica’s Rujuvenating Dual Serum is a really unique product that just happens to be perfect for travel because it’s formulated for both day and night use. The plastic bottle houses two chambers of ingredients you mix together in your hand (that’s why it’s called “dual serum”). Made with a 95% concentration of patented MRCx™ formula as well as advanced copper peptides, amino acids, anti-oxidants, and plant-based extracts, it helps prevent and reverse the signs of aging. The serum has a very creamy texture, so if you have combination skin like I do, you can easily skip moisturizer. Made with many of the same patented ingredients as the Dual Serum, Regencia Revitalizing Eye Crème takes care of all possible under eye problems, which are just inevitable when you travel, including puffiness, wrinkles, dark circles and fine lines. It can be used both day and night. You know how your face feels dirty when you’ve been traveling all day? 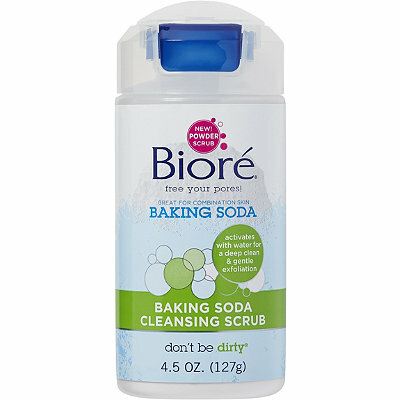 If you are dying for a squeaky clean visage again, all you need to do is use Bioré's Baking Soda Cleansing Scrub. It exfoliates deeply, but gently, getting the gunk out of your pores and balancing your skin. Because this scrub is a powder and not a liquid, you don’t have to worry about spilling. You could even put a little bit in a Ziploc bag, but I’d avoid doing that if you are taking a plane. If a toothbrush could be a super model, the Plus Ultra Toothbrush would be it. Made from 100% organically grown Moso bamboo, it’s way more sleek and stylish than a typical plastic brush. It’s also biodegradable, sustainable, anti-microbial and comes with bonus karma points. If that isn’t reason enough to brush with a Plus Ultra, the brand was started by #GirlBoss Christina Ramirez. I met her personally at an event I'm going to post about on Monday and her brilliance just wowed me.